Pandy's of Lake Sunapee: Isn't He Sweet? I know we all think our children are the cutest things on the planet....but my son, who is my model for GriffinGear has moments of extreme cuteness. I wanted him to sit on the retaining wall with the perennial bed in the background.....he kept walking and said, Mummy, I want to sit by the forget me nots. Then, as I'm taking the picture, he reaches around and picks one. 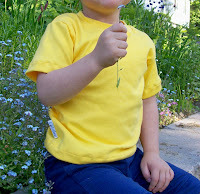 As I took this picture, he was saying, Mummy, I picked this flower for you because I love you. Sometimes they just melt your heart, don't they!